S.O. 2806(E).—In exercise of the powers conferred by sub-section (6) of section 1 of the Payment of Wages Act, 1936 ( 4 of 1936), the Central Government, on the basis of figures of the Consumer Expenditure Survey published by the National Sample Survey Organization, hereby specifies rupees twenty four thousand per month as the wages under said sub-section (6). 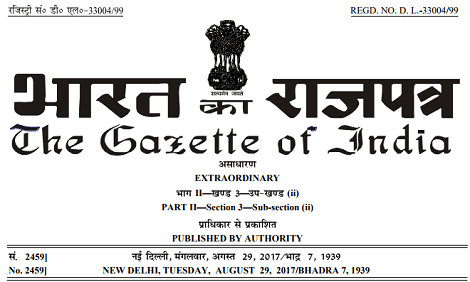 Central Government Employee News and Tools: Enhancement of Wage Ceiling under Payment of Wages Act, 1936 to Rs.24,000/- p.m.
MINISTRY OF LABOUR AND EMPLOYMENT NOTIFICATION New Delhi, the 28th August, 2017 S.O. 2806(E). Hereby specifies rupees twenty four thousand per month as the wages under said sub-section (6).